Demand for farmland remains strong despite the challenges and uncertainties facing farm businesses, claims a leading agent. 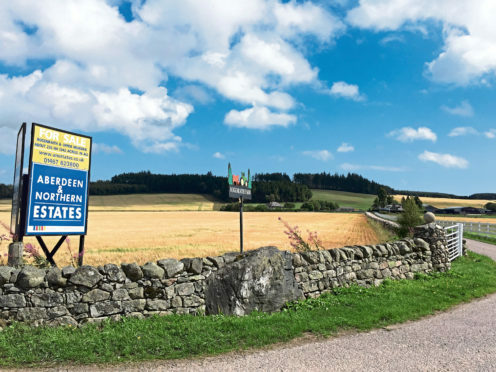 James Presly from Aberdeen and Northern Estates Ltd (ANE) said the firm exerpienced healthy and steady demand for farms and farmland during the first half of this year. “Whilst the early months of 2018 saw a relatively short supply in the market, this has given way during the summer months as more farm properties have been launched,” said Mr Presly. He said initial pricing was often the key to a successful sale and farmers are advised to price realistically and sensitviely to drum up demand for their property. “We have reported in the past that we are finding buyers’ outlooks to be focused ahead, past the relatively short-term political uncertainties,” added Mr Presly. He said ANE had recently launched two well-equipped farms to the market and both have already attracted good interest. These are the 542-acre Bogenraith Farm near Durris, Banchory, and the 230-acre Easter Jackston Farm at Longmanhill, Banff.